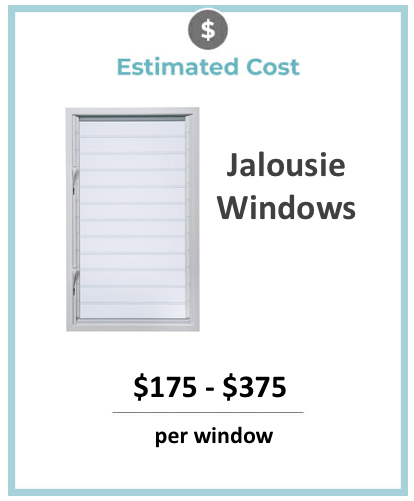 The average cost for a replacement jalousie window installation is $175 to $375 per window + labor costs which can average around $38 per hour depending on your local window installers average price. See local window prices below. It’s common for older homes to have windows split horizontal sections which open and close at an angle. While they aren’t as popular today as they used to be, these jalousie windows are effective at ventilating a home, offering benefits that modern homeowners in warmer climates will appreciate. 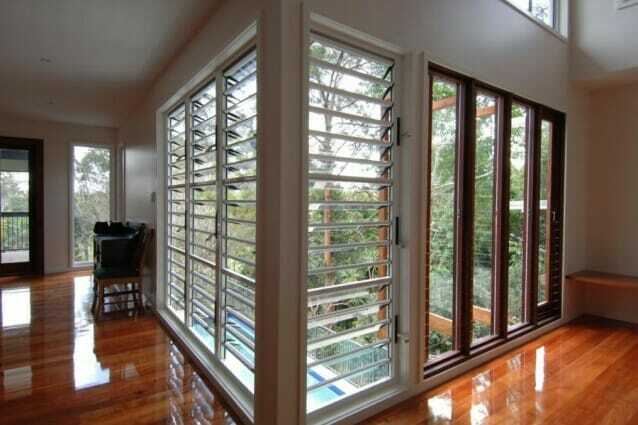 Jalousie windows’ horizontal slats are layered on top of one another, similar to shingles or siding. The top of the bottom slat is covered by the bottom of the slat above it and the cycle continues all the way up. A crank opens the slats. As the crank is turned, the bottom of the hinged slats tip up and out creating an opening. Most can become fully horizontal creating a nearly unobstructed view of the outdoors. Most of these windows make use of glass panels, especially the modern options, but some use aluminum panes, or other solid materials to create a more durable window. These solid panes can still both ventilate and create a view because of the way in which they open. If you like to keep your windows open during a storm, you’ll enjoy having jalousie windows. Like an awning window, their slats help repel rain and keep the weather out, allowing you to to bring in the storm’s cool air without soaking the floors and other surfaces around the windows. Compared to double-hung or single-hung windows, you can get more airflow through jalousie windows by making use of the entire opening. With single or double hung windows you can only have half the space open at one time. 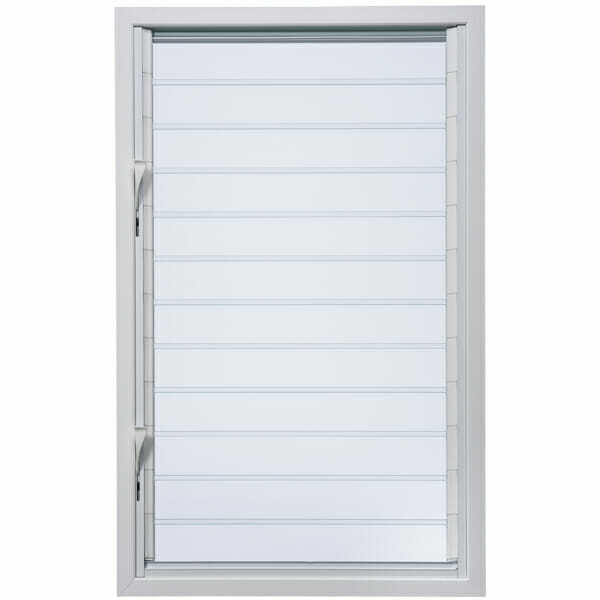 Jalousie window slats are easy to repair and cost effective because you only have to replace the damaged slat. Traditional windows usually require full pane replacement, which is more costly. When a section of your jalousie window breaks, you unhook that section and put a new one in. This easy maintenance is one of the main reasons people favored these windows decades ago when glass was less durable and more prone to breaking. Yet another benefit of jalousie windows is that the slats are replaceable with different types of glass and even non-glass materials like aluminum or wood. If you decide that you want to transform your window into a shutter, or a stylish frosted privacy window you can do so easily. Simply unhook the sections and slide out the current glass slats and replace them with same-size replacements. It’s much easier to change the look and function of this type of window than a full-pane type of window. Jalousie windows don’t hold out the rain, snow and wind like solid windows do. There are too many openings and they aren’t sealed or secured as well as a double-hung, single-hung or casement window. Jalousie windows aren’t ideal for homes in northern climates because they lack the insulating properties of other windows. Due to their numerous sections, they have too many gaps be able to effectively seal. If you’re trying to keep your home nice and warm, and you live in a cold climate, only make use of these windows in sun rooms. If you’re looking for a low-maintenance window that lets you ventilate your home during a rainstorm, consider jalousie windows. Find a reliable window replacement contractor to install your new jalousie windows. However, they do have limitations If you live in a cold climate, or you want a window offering better insulation for your home, you should consider awning windows which offer many of the benefits of jalousie windows without the drawbacks.